In this painting the placing of the figure was important for two reasons. Firstly, the figure is central to the message and therefore should be ‘centre stage’. Secondly, the human figure within a landscape painting is a ‘heavyweight’ in terms of balance. So after everything else is in place, the figure is positioned, bearing in mind these two considerations. At the planning stage I use charcoal to map out the structure. This sometimes requires correcting by rubbing out the previous drawing, or parts of, to make corrections. Charcoal leaves a ‘ghost image’ after its rubbed out, which is good, as each correction is made you can see where the error was. However, all this planning and drafting will be covered up by the initial painting. Near the end of painting, the figure has to be placed. The position dictates the scale or size of the figure, i.e. nearer, the figure is bigger and visa versa. The painting is ‘alla prima‘ which means placing wet paint onto wet paint. There is no room for errors, you get one shot at it. If the placing is wrong the cleanup operation is a ‘nightmare’. The best recovery method would be to let the painting dry, after the offending paint is scraped off, then repaint the background and try again. But when you get it right – phew, the satisfaction. A trick I employ which gives a little help to this critical operation is to ‘scratch’ the figure onto the wet paint using the blunt point on the handle of the brush (see video). If corrections need to be made the scratch marks on the wet paint can be repaired easily. UPDATE: Christmas Cards available at ONLINE SHOP. 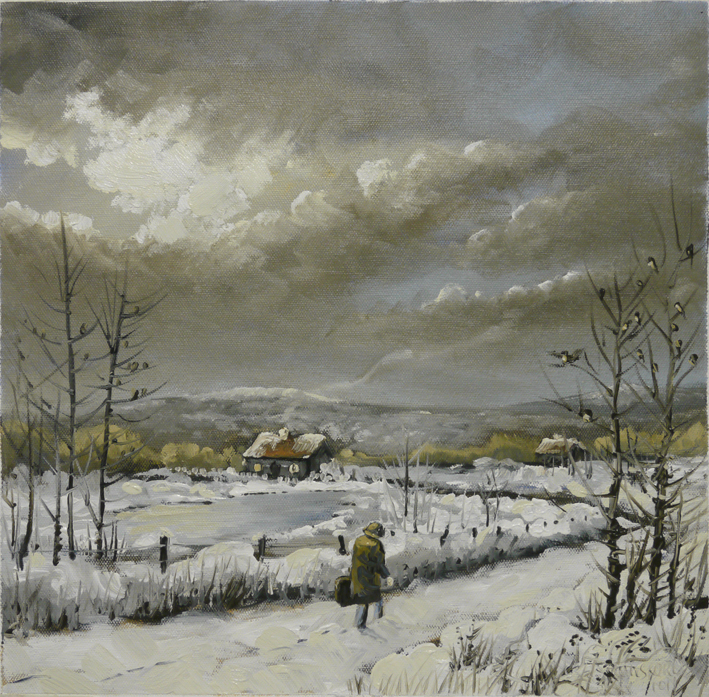 This entry was posted in Oil Painting and tagged Art, Christmas Scene, Culture, Education, Inspiration, Irish landscape, Oil Painting Instruction, Snow Scene, Time lapse painting. Bookmark the permalink. wow – your videos are beautiful and amazing to watch! first of all, thank you so much for liking my posts on my adventures in making my first calendar, you are very kind and seeing that you are a professional artist (I’m just starting out) I take your LIKE as a true compliment to my work and as inspiration to continue…and now about you and your art: I most definitely, if it’s not a problem with you, would like to share your time lapse videos with my oil painting classmates through our group on facebook…thank you and read you soon!! Thank you for your nice words. Art is about sharing, I would be delighted if you would share my videos with your classmates. I hope it’s useful to them.